With the dust barely settled after the Korean LG Optimus G's run around out review track, we have its LTE packing, US siblings on our hands. The LG Optimus G E970 for AT&T and its LS970 relative for Sprint are the two versions which are offered across the Atlantic. Thankfully, the wait for their arrival wasn't long at all - LG pulled off a launch which looked a lot like what Samsung did with the Galaxy SIII earlier this year. 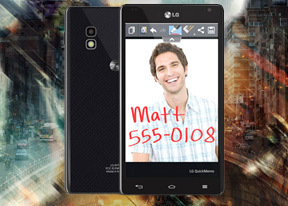 The LG Optimus G E970 and its LS970 relative are slightly different characters. The AT&T version comes with an 8MP camera and a microSD card slot. The Sprint-flavored Optimus G on the other hand, is practically identical to the Korean version, which we have reviewed already. This means that users will enjoy a larger, 13MP camera sensor, but will have to settle for 32GB on non-expandable memory. Most importantly however, both smartphones come with the headline grabbing Qualcomm Snapdragon S4 Pro chipset and two gigs of RAM, which means that, regardless which one they pick, potential users will get to enjoy the most powerful Android hardware around. Here goes the full list of talents which the US LG Optimus G duo has to offer. There is hardly a box left unchecked by the LG Optimus G duo. Both devices offer impressive hardware and gorgeous screens. Even the software is a massive improvement over LG smartphones of old. Of course, the long list of features can do anything for a smartphone but guarantee its success. This is particularly the case in the US market, where the LG Optimus G has to face incredibly stiff competition. We are going to kick the review off with a quick unboxing, followed by a design and build quality inspection of both the LG Optimus G for AT&T and Sprint Wireless. The dedicated camera section on the other hand, will closely examine and compare LG's 13MP and 8MP camera sensors' performance. Editorial: You might notice that this review is shorter than usual and doesn't include all of our proprietary tests. The reason is it has been prepared and written far away from our office and test lab. The LG Optimus G for AT&T and Sprint are US-only phones, so they will probably never get to the shores of the Old Continent. Still, we think we've captured the essence of the phones in the same precise, informative and detailed way that's become our trademark. Enjoy the good read! I have lg e970 ....When I call on Skype it stops and come to main screen Can I use Skype on this cellphone Anyone help me !